[toc]If you are experiencing lot of itching on the skin, it is the sign that you are suffering from scabies. It is a condition that is caused due to the presence of mites just below the skin. The mites can reach to the surface of the skin via air or through infected clothes. Indica extract is a natural disinfectant, used in medicines due to its abilities that help in curing most of the diseases in the world. It is also one of the best cures for avoiding bacteria based itching. A person can apply the crushed indica leaves on the infected area, apply Margosa oil or even take bath from the water containing indica leaves in it. The extracts avoid the bacteria to grow in body again. Another most effective and a tried and tested formula to cure Scabies naturally is through tea tree oil. It’s an easily available source and can be applied directly on the infected area for immediate relief. It is also prescribed to mix the tea tree oil with the distilled witch hazel which prevents the bacteria from growing again in the body once it is cured. This also improves the immune system of the body. One of the sources of the mites to enter the body is clothing. Therefore, one should make sure that the clothing or even the towels used are washed in disinfectant and dried in sun to ensure that no bacteria or harmful substances are dwelling in them that can make the condition worse for the person already suffering from the disease. Also, before wearing fresh set of clothes the person should ensure that the body is dried. 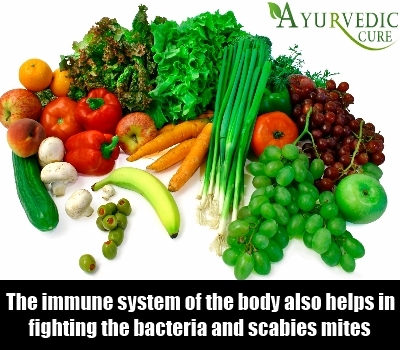 The immune system of the body also helps in fighting the bacteria and scabies mites. Although the change in diet pattern may not directly impact the infected area, it can help in improving the immune system and fighting the bacteria in a better manner. Your diet should include fruits like apple and oranges, vegetables like onions and garlic and fresh vegetable juice and nuts that help to boost body immunity. Vitamin E has the properties that help protect from the diseases of skin and many other internal body ailments. There are ointments in market that contains extracts of Vitamin E in them and can be applied on the infected area. It is better if you consume Vitamin E in a natural way by eating vegetables and fruits like Avacados, Kiwi, broccoli, pumpkin, mangoes, potato, papayas, lettuce, etc. A person can also apply almond oil and hazelnut oil on the infected area.